Aptec Holdings celebrates 30th anniversary and 30th participation at GITEX. Dubai - 20th Oct 2010 – Aptec Holdings, one of the largest technology distributors in the Middle East, Pakistan, Turkey & Africa celebrated its 30th anniversary at Gitex yesterday. Aptec also celebrates its 30th participation at Gitex making it the elite few which have been at Gitex from its start in 1980. 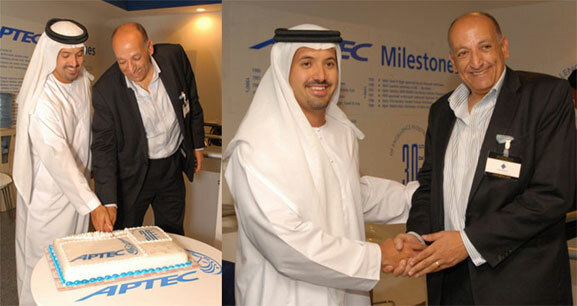 The celebration was marked with a cake cutting ceremony by Dr. Ali Baghdadi, CEO – Aptec along together with Helal Al Marri, CEO -Dubai World Trade Center. To mark this milestone Aptec Holdings was joined by the who’s who of the global multinational vendors that included Oracle, Dell, Symantec, Microsoft, Net Apps, D-Link, IBM, McAfee, HP, Cisco and others. Dr. Baghdadi also thanked Aptec’s channel partners, vendors and end-user customer for their support and whose belief in the company has contributed to this success. He also paid tribute to Helal Al Marri, CEO –Dubai World Trade Center for making GITEX one of the most recognized technology trade fair in the Middle East and Africa region.